I have been looking for patterns for a while now, but could not find one. The middle column always points the same direction. The first two in the first row are always opposite. The last two in the second column are always opposite. Still, these rules are insufficient. following each of the 6 positions through in sequence, the directions of the arrows rotate by 90 degrees clockwise each time except when they point up or down, where they stay twice in a row. From there the solution is pretty clearly option C.
In first and fourth pattern the arrows point in opposite directions. Likewise in the second and fifth pattern. 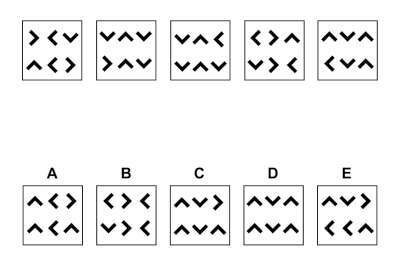 Therefore the sixth pattern should be the opposite of the third pattern, so the answer is C.
All the pointers are rotating clockwise pointing up and down twice and sideways once. Each arrow in the same position in 1 and 4 are pointing in the opposite direction, as is the arrows in 2 and 5. On that basis image number 6 would be the same as 3 with the arrows pointing in the opposite direction. The only image that does this is C.
Not the answer you're looking for? Browse other questions tagged pattern geometry lateral-thinking or ask your own question.